Editor’s Note: For most observers in the world of tennis, the story of Serena Williams’ emotional rejection of the Indian Wells tournament is a faint and distant memory. However, our coverage of the last 14 years of pro tennis is unrivaled in the world of online news. Matt Cronin of TennisReporters.net was there. With the return of Serena Williams to Indian Wells, we are re-running Matt’s story written from the tournament that appeared on this site. Matt’s coverage of the event originally appeared in Inside Tennis. Revisit Serena, 10 minutes after her sister, Venus, had caused the biggest hullabaloo the desert had seen since the discovery of the hot springs by pulling out of the sisters’ highly anticipated semi with a sore knee. When informed that few people believed that Venus was too injured to play and that Elena Dementieva had stated the day before that it would be Richard’s decision as to who would win the sisters’ match, Serena wowed no one with her casual indignation and less than emphatic denials. God bless America, let the speculation ring. Over the next few days, newspapers, wire services, TV, radio and the Internet were filled with more tennis-related stories than the sport has seen in a non-Grand Slam week during the Open era. Unfortunately, the stories were of the “Are the Williamses rigging matches?” veriety. That Serena was able to fight off the most hostile crowd in California history and subdue hard-hitting Belgian Kim Clijsters 4-6, 6-4, 6-2 for the title is a minor miracle, if you consider that the debate that raged for four days over the Williams’ family affairs had ruinous implications for the sport. Serena and Venus rarely read the press and appear sheltered enough that they don’t yet comprehend what even the suspicion of matches being fixed can do to a sport — like the Black Sox scandal did to baseball. If the Williamses did get this, then they might not have kept shrugging off questions for the two days leading up to the final and would have emphatically denied the accusations when they occurred. Instead, tennis was bloodied from the moment Dementieva let loose on Wednesday evening and didn’t come off the mat until Sunday morning, when the last newspaper hit the sidewalk with Serena’s denials. Without question, the Williamses are partly to blame for the scandal. Who else is to blame? The players who speculated that the sisters’ matches have been fixed with no evidence save for how badly they usually play against each other. Senior Sanex WTA Tour officials, who ignored the significance of Dementieva’s comments until it was too late; and who have little or no personal connection to the Williams’ family despite the fact that the family has been on the tour for five years now. As a result, the situation got so out of control that the tour gave itself a gigantic black eye, one that may take years to repair. Why didn’t they act more quickly? Some claim that officials feel that any press is good press and that the players should be viewed more as entertainers than athletes — the integrity of the sport be dammed. So why the meltdown here and why the first two weeks of March, rather than in some other month at some other tournament? Could it be because it was the emotionally volatile Richard who accompanied the girls to the desert, rather than their more mellow mother, Oracene, who is now separated from Richard? Williams observers say that Venus and Serena are much more skittish when Pop is around and, given the numerous problems that have occurred between Richard and Oracene over the past six months, it’s no wonder that both Venus and Serena have played sparingly since last October. 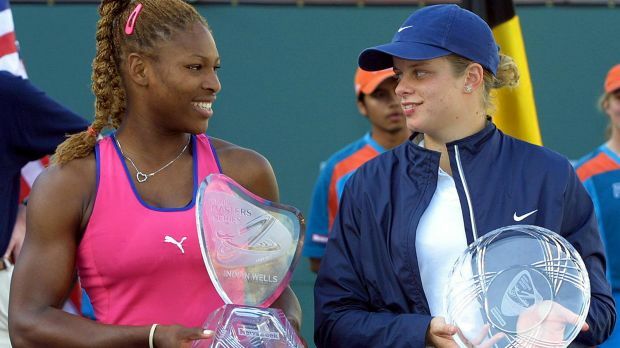 At Indian Wells, both the Williamses played reasonably well, but off court, they were as cagey and as defensive as they’ve been at any time during their careers. Coming into Indian Wells, Serena had played in only three tournaments since being bounced out of the 2000 U .S. Open quarters by Lindsay Davenport. She won Tokyo at the end of September, but took time off to go to school and suffered a stress fracture in her foot. She didn’t reappear on tour until early January in Sydney, where she lost to Martina Hingis in straight sets. At the Australian Open, Hingis took her down again, this time in three marathon sets. Serena, who ended last year ranked No. 6 but failed to win a Slam title, wouldn’t let on to what her goals are this year. Venus, who dominated the tour for five months last year, has yet to win an event this year and is playing nowhere near up to her capabilities. Yet in the quarters she slugged tough-talking Dementieva into the pavement in a 6-0, 6-3 victory. That’s when the trouble began — KGB style. The sisters have played five times, with Venus owning a 4-1 edge. Serena’s won once — in a fairly inconsequential ’99 Grand Slam Cup final. The Williams family chose not to respond to Dementieva’s comments during the day on Thursday and it wasn’t until after Venus’ withdrawal four minutes before her semi against Serena that they discussed it. But now the situation had been compounded, because most observers believed that Venus should have at least tried to play, despite patellar tendonitis in her right knee. WTA Primary Health Care Provider Michelle Gebrian did back up Venus’ claim, saying that Venus was unable to pass basic functional testing. Because the match was canceled until most people had already taken their seats, fans reacted in anger, raining a loud chorus on to the court when it was announced that Venus was pulling out. A handful of fans went to ticket windows and demanded their money back. “I did everything I could do to be able to play tonight,” said Venus. But neither Williams yelled, “No,” at the top of their lungs, even when they were specifically asked to do so. At the final, Serena faced Kim Clijsters. First the crowd raged at Serena when she walked on court, then booed and hissed at Richard and Venus Williams as they walked down the stair to the Friends Box. The crowd continued to hoot and holler with a vein-popping intensity throughout Serena’s three-set win. For the past 18 months, Serena hadn’t shown the mental fortitude that she displayed in winning the ‘99 U.S. Open, frequently skipping tournaments and folding in big matches. But in the desert, she dug within herself and rediscovered the it’s-me-against-the-world mental toughness that made her the Queen of New York. “I won a big battle today mentally, more than anything,” Serena said. Serena then (finally) took the Enquirer’s Wimbledon claim head on.